I was born and raised in Westerly, RI, a small town in the southwestern corner of Rhody. I’ve been living in Manhasset for the past 24 years. I’ve been married to my beautiful and incredibly patient wife Paula for almost 23 years, who in addition to putting up with me, leads the charge in making sure our two children, Skyler (16) and Cole (13), are fed, do their homework, and take their shoes off in the mudroom. 2. What is your favorite Team Boomer memory? Having had the good fortune of participating in numerous Team Boomer events over the years – there are so many to choose from. While crossing the finish line at the 2014 NYC Marathon (#ONEANDDONE!!!) on behalf of Team Boomer certainly ranks up there, it is awfully tough not to choose our team effort in Team Boomer’s annual Central Park “Run To Breathe”. 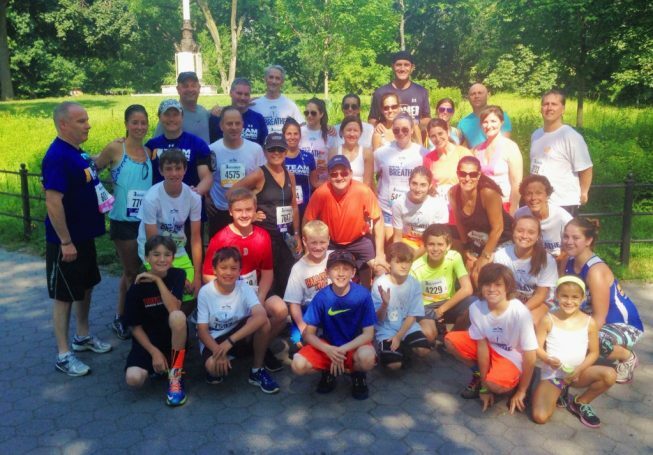 “Team Etonanddrinkinforacure” was thirty-eight members strong at the July 2014 race. Getting such an incredible group of family and friends together to run was overwhelming. But the highlight of the event was having my Goddaughter Elizabeth sing the National Anthem at the start of the race in front of 7,000 participants (more on Liz below). This year we’re shooting to have fifty people on our team to help continue to spread awareness of CF and help people learn more about BEF and the invaluable work it does. 3. What is your best fundraising tip? Reach out to everyone you know. Don’t be shy about asking for people to help support you in a race, to donate to a BEF event, or simply to make a donation to the organization. I am consistently amazed at the feedback I get from people who have been touched by someone in their lives with CF – a family member, a friend, a business associate, a college acquaintance. If you are training for an event and asking for people to donate to your fundraising efforts, make sure to keep them in the loop on your training, the highs and lows, the race date (make sure to ask for prayers and cool weather on race dayJ). Follow up with a personalized thank you to those who donated. Send a group thank you to your master list of people you reached out to thank everyone who donated…and add a friendly reminder to those who may have forgotten to donate that there is still time to do so! Send a post-race follow up with a picture of you crossing the finish line. Believe me, it works! People want to help. You just need to reach out to them. I run because of my Goddaughter Elizabeth. Liz is a sophomore at Brown University and she has CF. She is a brilliant, kind, beautiful, caring young woman any parent would be ridiculously proud of. Over the past two Christmas breaks from school, while most college students were looking to relax and maybe take a vacation somewhere Liz went to South America to work at orphanages to help assist in providing sorely needed medical attention to the children in the villages she visited. That alone speaks volumes about the person she is. Upon graduation from Brown, Liz hopes to go to medical school with the intention of practicing medicine in a Third World country, providing the medical care to underprivileged children. I’ve watched Liz grow up into this amazing young adult while battling CF. I see how she takes on the challenges of her illness and am in awe of her spirited fight in living every day to its fullest. Liz is why I run. We WILL find a cure for Liz, Gunnar, and all others living with CF.